Summary: The brand-new Air Climber Workout System makes exercise fun! 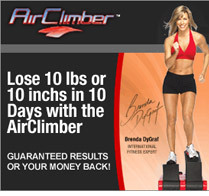 Now get cardio, weight loss and tighter abs and core while you step on air with Brenda Dygraf's new AirClimber System. It’s the fun workout that uses air to eliminate impact, while each step lifts and shapes toned legs while you burn carbs. Plus, Brenda’s exciting workouts combine fat burning,total body toning and an ab work out, all in one. Try the total gym system that helps you lose weight and get in shape at home.